Sea Resources Management is celebrating World Oceans Day on the 8th of June again! World Oceans Day allows us to highlight the importance of the oceans. The oceans affect our daily lives significantly, most noticeably as a direct source of our food and as a means of transport for our products throughout the world. But processes such as climate change and rainfall patterns are also influenced considerably by our oceans. Besides that, the oceans provide a home and a source of life for countless species of flora and fauna. They also provide jobs for millions of people and endless opportunities for inspiration and recreation such as diving, snorkelling, fishing, and boating. Sea Resources Management is passionate to raise awareness of the current challenges faced by humans, animals and the environment in connection to our oceans. 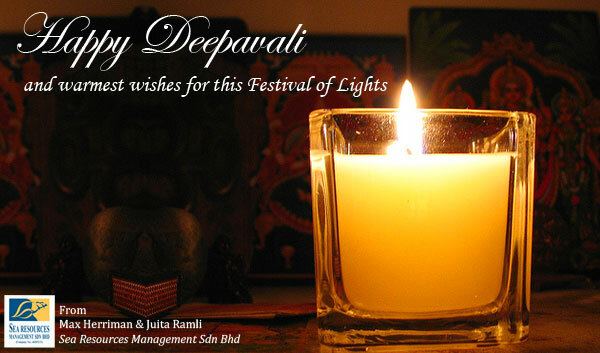 We continue to do so, particularly in the Asian region, through our projects and public engagement. 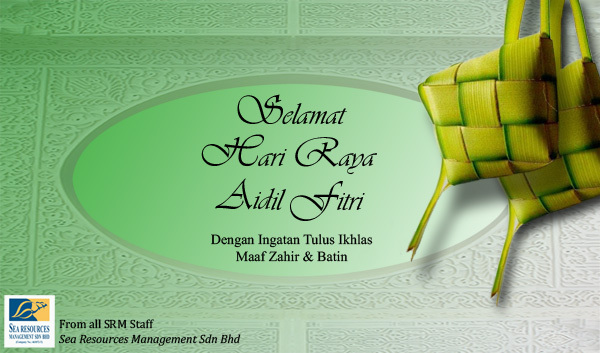 We hope you will celebrate this day with us! Please have a look at the following links to see what you can do to help conserve our world௣eans. 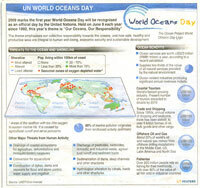 World Ocean Day was first proposed in 1992 and has been unofficially been celebrated since then. Last year, on the 8th of June 2009 the world saw its first official World Oceans Day after the United Nations General Assembly passed a resolution in December 2008. MARINE scientist Choo Chee Kuang is among the many advocating for the protection of the Sungai Pulai estuary and the Pulau Merambong seagrass bed in south-western Johor, the habitat for seahorses which he has been studying. The area is a mix of mangrove forests, seagrass beds, mudflats, rocky shores and coral reefs and all are threatened by various development, including that of ports and power plants. In 2004, Choo founded the non-profit Save Our Seahorses (SOS) and together with other supporters, have organised various programmes to protect the wild habitat there and raise public awareness. This guidebook is useful should you be visiting Sungai Pulai, a gazetted Ramsar Site (which makes it a wetland of international importance), as it lists down the best time to go there and what you can see. When the tide recedes, all kinds of marine creatures lie exposed, waiting to be discovered by visitors. 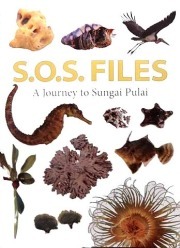 The book describes the different species of sealife and plants, such as sea sponges, echinoderms (starfish and sea cucumbers), cnidarian (corals and anemone), ascidians (sea squirts), birds, worms, fish, seagrass, crustaceans, marine mammals, seaweed, molluscs, reptiles and mangrove plants. To better appreciate the biodiversity of Sungai Pulai, it is best to join the SOS volunteer programme which includes monitoring the seagrass bed and surveying seahorses. Go to sosmalaysia.org for more details. 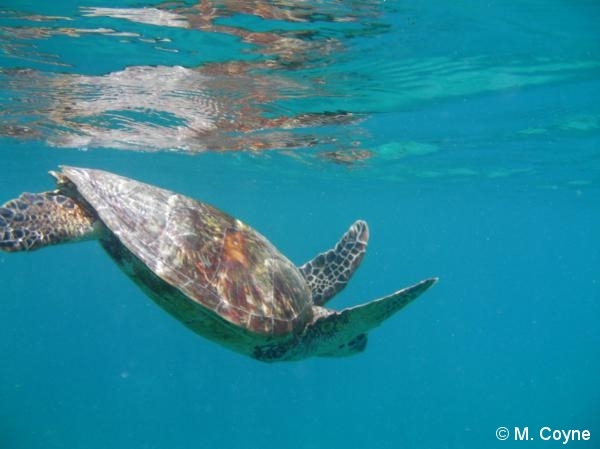 Let's celebrate this day and remind ourselves of the efforts taken (and not taken) to stop turtle-egg poaching and other activities that are threatening our turtles to extinction. Kudos to the Malaysian Turtle Rangers, for their efforts in creating awareness on the importance of preserving turtles and their eggs in Malaysia! 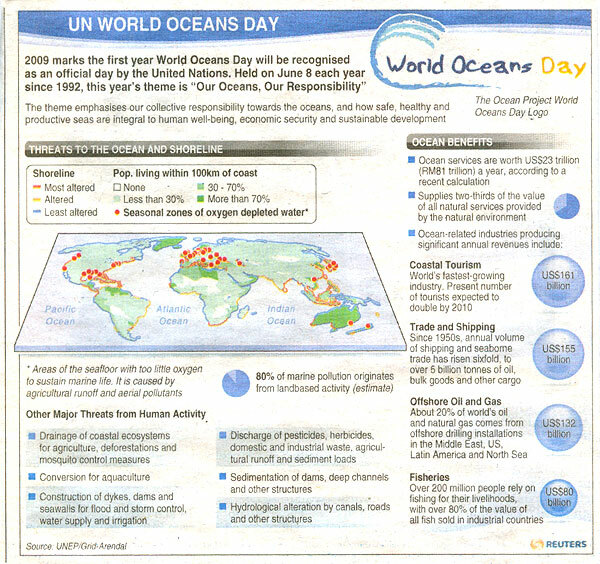 Today, Sea Resources Management celebrates World Oceans Day 2009. The condition of the world௣eans is alarming as it has deteriorated quicker than ever in recent years. Coral reefs - important food, medicinal, economic, aesthetic and cultural resources - are particularly vulnerable to these changes. Scientists are recording record coral reef die-off and are worried about the future survival of these treasured ecosystems. The ocean and climate are inextricably linked as the oceans play a crucial role in maintaining the Earth࣬imate, while ocean life is vulnerable to climate change. As human activities produce too much carbon dioxide, it is absorbed by the ocean and, as a result, ocean waters are becoming warmer and more acidic. These changes threaten the fundamental building blocks of life in the ocean. Therefore, through our projects and public engagement, SRM hopes to contribute to an increase in awareness on the state of our oceans, particularly surrounding the Asian region, toward recognizing the importance of the oceans to all forms of life on earth. Please visit the following websites to learn more about World Oceans Day and the importance of the Oceans in general. 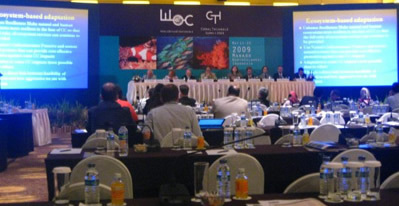 The WOC 2009 serves as a platform for the participants to discuss and exchange current issues in the marine field which are related to climate change. The WOC 2009 aims to increase efforts in the following areas: cooperation between countries in order to manage marine resources in the context of climate change; understanding the role of the oceans in global climatic phenomena; mindful of the vulnerability of small islands and coastal areas to climate change; commitment from various governments and intergovernmental organizations to protect and conserve fisheries resources to ensure food security; preparedness to face impacts of climate change; and capacity of the coastal communities, particularly coastal and small island communities, to adapt to the effects of climate change. The major issues discussed/professed during the four-day conference was, inter alia, the relationship of climate and ocean, the impact of climate change to the oceans and coastal communities, the climate change implications for fisheries, and the adaptation measures of coastal communities to climate change. Delegates from various countries intervened at the end of each session to share their perspectives and challenges encountered in their home country. 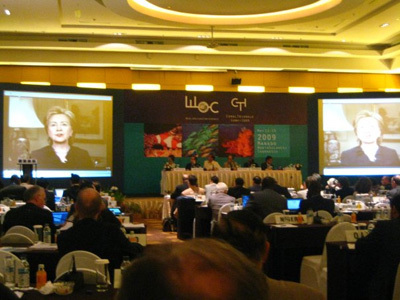 On the final day of the conference, US Secretary of State Hillary Clinton also expressed support for the outcome of the conference via video recording. 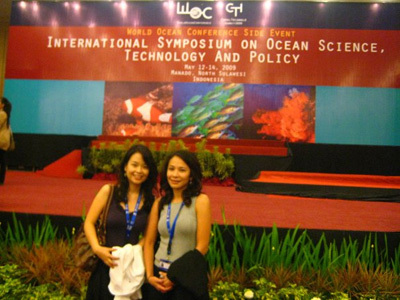 She indicated that the WOC 2009 could "help focus the world's attention on the link between oceans and climate change, and advance global efforts to find science-based solutions to the problems we face". The Final day also saw the participating countries reached an agreement to cooperate in improving marine resource management alongside global climate change impact mitigation which are included in the Manado Ocean Declaration. The Manado Ocean Declaration highlighted the need for national strategies to achieve sustainable management of coastal and marine ecosystems; call for comprehensive adaptation measures to address climate-related problems; reiterate the need for financial resources in helping developing countries to protect their coast; promote renewable ocean technologies; and encourage cooperation among countries on marine scientific research. Nevertheless, the declarations also call for parties to the UNFCC to develop a project proposal on 쩭ate Change Adaptation䯠the Adaptation Fund Board. The Manado Ocean Declaration can be found here (PDF file). 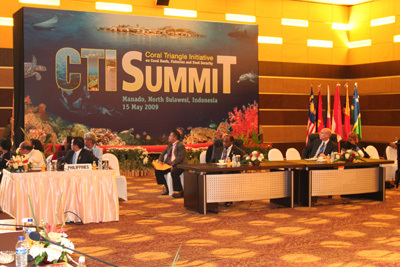 The WOC 2009 culminated with the Coral Triangle Initiative (CTI) Summit which was attended by our honourable Prime Minister, Najib Tun Razak, along with leaders of Indonesia, Papua New Guinea, the Philippines, Solomon Islands, and Timor Leste. The USA and Australia attended as observers. 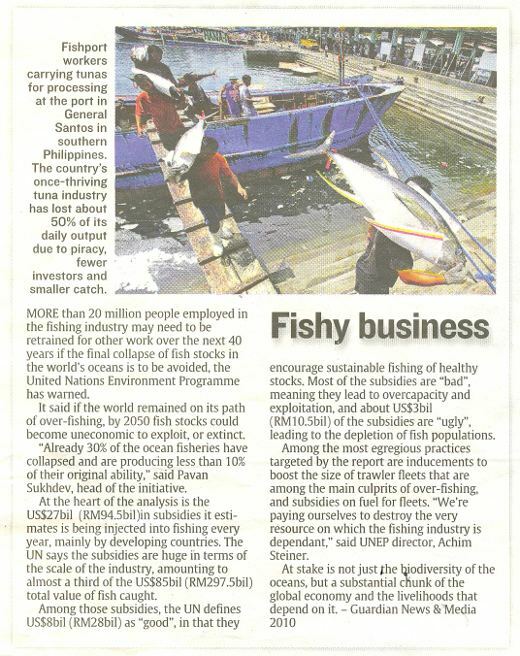 SRM CEO, Max Herriman, was invited by the Malaysia National Oceanographic Directorate (NOD) to participate and contribute ideas to the Summit. The outcome of the first CTI Summit is the adoption of a Regional Plan of Action to conserve and sustainably manage coastal and marine resources within the Coral Triangle region. The six CTI leaders each pledged to allocate funds for CTI programs. These allocations will then be matched by developed countries through the Global Environment Fund (GEF) administered by the Asian Development Bank (ADB). ࠠ᭯ng those seven members, Judge Wolfrum (Germany), Judge Akl (Lebanon), Judge Marotta Rangel (Brazil), Judge Chandrasekhara Rao (India) and Judge Jesus (Cape Verde) were re-elected and Mr Bouguetaia (Algeria) and Mr Golitsyn (Russian Federation) were newly elected by the States Parties. The biographies of the judges who were re-elected are available on the website of the Tribunal and those of Mr Bouguetaia and Mr Golitsyn may be found in document SPLOS/173 which is available on the website of the Division for Ocean Affairs and the Law of the Sea of the United Nations at www.un.org/Depts/los. Source: ITLOS Press Release, 16 June 2008. Sabah, Malaysia: The CEO of Sea Resources Management Sdn Bhd, Max Herriman, and Executive Marine Consulting, Lee Siow Ling, participated in the Seventh Intergovernmental Session of the IOC Sub-Commission for the Western Pacific (WESTPAC-VII) as members of the Malaysian Delegation. At a side-event workshop run by the National Oceanography Directorate (NOD) of Malaysia, Max Herriman also presented a paper on 쯢al Environment Change࡮d facilitated a break-out session to determine new project proposals on the topic of 襠ecological and socio-economic impacts of marine natural hazards and global climate change̥e Siow Ling arrived in the week before the WESTPAC VII Sub-Commission session to attend the associated International Scientific Symposium, 21-25 May 2008. 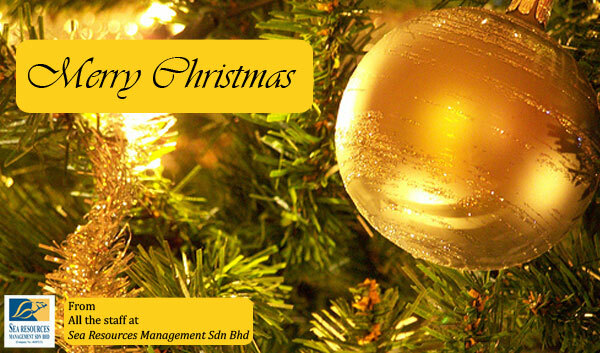 All events were held at the Magellan Sutera Harbour Resort, Kota Kinabalu, Sabah. The Agenda for the WESTPAC-VII Session included a comprehensive report on inter-sessional activities and a budget overview by the Secretariat. Emphasis was placed on the limited budget availability for IOC WESTPAC activities and an appeal was made for Member State financial support in order to enable implementation of the planned program. Comment was offered by delegates on the need for the new IOC WESTPAC Strategic Plan to demonstrate relevance, effectiveness and efficiency. Also, delegates observed that IOC activities, especially capacity building, need to be coordinated and to take into consideration all IOC initiatives, along with those of other bodies, e.g. UNDP, GEF. This was noted to be especially important for non-science activities, which are of equal importance for IOC-WESTPAC. The Executive Secretary of IOC-UNESCO, Dr. Patricio Bernal, commented that Member States must decide on the projects that are important to them and to be prepared to fund and support such projects. He noted that potentially there is much to be gained for these projects by working through the coordinating structure of the IOC, but that the IOC budget is unlikely ever to be sufficient to fund the necessary projects from within the UN budget. Indeed, he observed that many of the professionals currently working on IOC projects around the world are not actually paid by IOC, but through project-based funding by Member States. Some possible examples of where the IOC framework has been used to support projects funded by Member States could include a program of Global Census of Marine Life, essentially a marine biodiversity mapping project, which will need to be repeated at determined intervals to accommodate changes brought about by anthropogenic influences. Also, the risk of marine hazards (frequency, intensity) has increased and will increase further with global and regional climate change. The western Pacific has many large coastal cities, and a project to assess marine hazard risk sits comfortably within the IOC coordinating framework. The Director General of the Malaysian National Oceanography Directorate (NOD) also presented a summary report on the International Scientific Symposium that had been held in the prior week to the WESTPAC-VII Session. Lee Siow Ling attended many presentations at the Symposium and generally was impressed with the level of scholarship and professionalism demonstrated by each of the participants. Our thanks to the Malaysian NOD for the invitation to participate in this important event. The CEO of SRM, Max Herriman, was engaged by the Office of International Affairs of the United States National Oceanic & Atmospheric Administration (NOAA) to facilitate a meeting on 7th April 2008 at the 4th Global Conference on Oceans, Coasts and Islands to discuss illegal, unreported and unregulated (IUU) fishing. 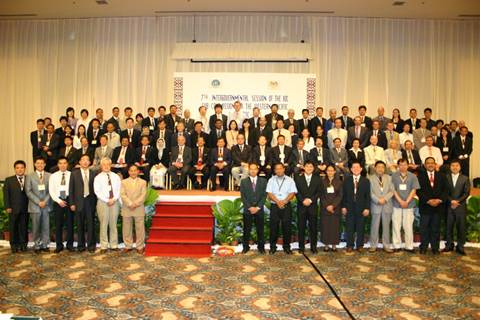 The Conference was held in Hanoi, Vietnam. The single-day IUU meeting was a side-event to the Global Conference. The meeting was complemented by a later presentation by representatives from the European Union on new legislation requiring flag State certification that fish exports are not caught illegally (see here), along with discussion of the US Magnuson-Stevens Re-authorisation Act 2007 (see here). - in the 64% of the ocean beyond national jurisdiction. It also sought to review progress on the allied goals of reducing marine biodiversity loss by 2010 and of establishing networks of marine protected areas by 2012 (goals adopted by the world's political leaders at the 2002 World Summit on Sustainable Development). These goals were considered in the context of climate change, which, as indicated in the 2007 report of the Intergovernmental Panel on Climate Change (IPCC), will have profound effects on ecosystems and coastal populations around the world. A series of informative and authoritative Policy Briefs was produced in support of the Conference. The individual Policy Briefs, along with a summary of the Conference outcomes, are available for download. Hamburg, 5 May 2008. At a ceremony held at the Maritime Museum of Malta on Saturday, 3 May 2008, the Secretary-General of the International Maritime Organization, H.E. Mr Efthimios E. Mitropoulos, presented the International Tribunal for the Law of the Sea with the 硲d for meritorious contribution towards the development, interpretation and implementation of international maritime lawԨe award was received by H.E. R駥r Wolfrum, President of the Tribunal. The award was presented to the Tribunal on the occasion of the 2008 graduation ceremony of students of the IMO International Maritime Law InstitutěM programme in International Maritime Law. Speaking on behalf of the Tribunal, President Wolfrum expressed his sincere gratitude to the International Maritime Organization and the International Maritime Law Institute for bestowing the award on the Tribunal, noting that it bears further testimony to the acclaimed contribution of the Tribunalવdgments to international law. The 塲 of the Dolphin 2007虏D 07) was launched on 17 September 2007 at a public event on Larvotto Beach in Monaco. The UN Convention on Migratory Species secretariat has declared year 2007 as the Year of the Dolphin in a joint initiative with its regional dolphin conservation partners: the British non-profit Whale and Dolphin Conservation Society; and TUI, a top tour operator in Germany. Threats faced by dolphins are rapidly increasing. Entanglement in fishing nets, marine pollution, prey depletion as a result of overfishing, and illegal hunting are some of the threats faced by dolphins. The Year of the Dolphin campaign aims to raise awareness of dolphins in the wild, the threats to their survival and actions to help the conservation and protection of their habitats. In conjunction with this campaign, multilingual dolphin manuals have been developed and distributed to travellers in TUI destination, and also passed to local schools. 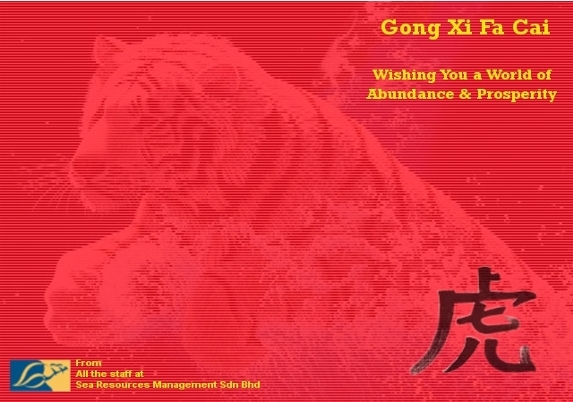 A אּhin Diploma衳 also been created to raise the awareness on dolphin conservation among children. Other efforts such as adopt-a-dolphin programs have also been introduced to raise funds for dolphin conservation programs. The YOD has been extended to 2008 and will be marked by a United Nations Environment Programme (UNEP)-supported documentary אּhins & Whales 3D쯡> ⩢es of the Ocean" will make its debut on IMAX 3D screens in the US in February 2008 before expanding into Europe. The 3D trilogy will highlight the need to protect these endangered marine mammal species. Please visit http://www.yod2007.org for more details on 塲 of the Dolphin 2007㡭paign activities. The MIMA Conference on Marine Tourism was organised by the Maritime Institute of Malaysia (MIMA), held at the Prince Hotel in Kuala Lumpur. The main emphasis of the conference was to disseminate knowledge on the Malaysian marine tourism sector through recent research undertaken. The conference was attended by some 80 participants: private sector, NGOs and relevant Malaysian government departments were represented by both delegates and conference presenters. Key aspects that came to the fore included issues like, the need for improved tourism data, sustainable tourism education programs and, improved and consistent tourism management practices within a sustainable resource use framework. It should be recognised that these challenges will only come to fruition if a concerted and coordinated approach towards marine tourism management is promoted. For details on how to get copies of the papers presented please contact MIMA or visit their website: http://www.mima.gov.my. The Australian Government Bureau of Rural Sciences has released the 鳨eries Status Reports 2006蓴atus of Fish Stocks Managed by the Australian Government). The 2006 report is the 12th edition covering 14 years from 1992 to 2006. The Australian Fishery Status Reports series is an excellent example of government transparency and commitment to excellence in fisheries management. The total allowable catch (TAC) for each stock. The Australian Fisheries Status Reports document is a useful, clearly laid-out document that could serve as a good example of fisheries reporting for other Governments around the world. Definitely recommended reading. We are pleased to announce that SRM consultants are now acknowledged by the international web-based directory ‘OceanExpert’. “OceanExpert (or the Global Directory of Marine (and Freshwater) Professionals) is a database, developed and maintained by the Intergovernmental Oceanographic Commission of UNESCO (IOC), containing information on individuals and institutions involved in all aspects of Marine or Freshwater Research and Management. It is intended to be a tool for scientists, policy makers and anyone who needs to contact a marine or freshwater professional.” (See http://oceanexpert.org/).
. Over the coming weeks, we will establish and register the necessary club structure for the ‘Marlinspike Rowing Club’ (MRC). We will provide an experienced coach – who is our very own CEO, Max Herriman, and will support the club with uniforms, equipment and trophies. To our knowledge, this is the first time that a private club has been formed to undertake river-boat racing in Malaysia. The club uses the facilities of the Putrajaya Aquatic Centre which is based at the Putrajaya Lake Club (view flyer) , and has access to single skulls, double-skulls, quad-skulls, racing pairs, racing fours and racing eights. There is also a fantastic rowing gym with seven ergometre rowing machines and a sweep-oar rowing pool. This will enable beginners to be instructed safely, and advanced rowers to use videos and large mirrors to perfect their technique. One of the Malaysian national coaches (Encik Halim Abdul Aziz) is the Centre Manager and may also be available to assist in coaching. The club also has access to a small power boat and loud-hailer to enable coaching on the lake. The club plans to race against crews from universities, visiting crews from regional countries, former national representatives who have set up an informal rowing group, and perhaps even the national training squad. For those who are interested in doing so, the MRC may send a team to compete in a Masters regatta in South Australia. Members will be advised of this possibility when details are finalised. Rowing is an excellent sport. It is practically injury free except sore muscles and blisters on your hands when you first start! The thrill of a racing boat slicing through the water under your own power is exhilarating. Also, the view at Putrajaya is beautiful, with the rising red mosque and other architectural features viewed from the perspective of the lake. You are welcome to attend training on any Sunday morning. Beginners are also very welcome and will be taught all the skills they need. However, you must let the club know if you can’t swim very well. This is a matter that would need to be addressed before you were allowed to train on the lake. At this stage, there is no cost to join the club, but you must pay a fee of RM10 per hour for the use of the boats. This boat-fee will be negotiated as the number of club members grows. If you are interested to know about Sunday rowing at Putrajaya or to be part of the ‘Marlinspike Rowing Club’, feel free to call us at 03 7956 0494 (ask for Ms. Betty Chan) or email: marlinspike@searesources.biz. On June 8th 2007, hundreds of communities around the globe celebrated the 15th annual World Ocean Day – a day to celebrate our individual connection to the sea, and how we all depend on it as a global community. The World Ocean Day was created in 1992 at the Earth Summit in Rio De Janeiro, Brazil. Although not yet officially designated by the United Nations, it is taken as a day for us all to celebrate and cherish our special relationship and connection to the sea; individually, and globally. The Ocean Project, working closely with the World Ocean Network, helps each year to coordinate events and activities with aquariums, zoos, museums, conservation organizations, universities, schools and businesses all around the world for the betterment in mass understanding of the oceans. The Ocean Project is the largest network ever to focus on conservation of the ocean; with over 850 partner aquariums, zoos, science museums and other educational institutions in over 70 countries. This was an unprecedented initiative that intended to create in people a lasting, measurable awareness of the importance, value, and sensitivity of the ocean. Working as a collaboration of its members, the Ocean Project are a non-profit conservation and environmental organization who actively involve people in conservation activities in their communities to better connect them to the ocean. Various events worldwide were set up in conjunction of the World Ocean Day, in order to create awareness, change perspective and celebrate the diverse importance and effects the oceans have on us. Among the activities which were lined-up were, exhibitions, beach cleaning projects, an awareness campaign, education shows and talks and also sea fairs. More information on how to contribute to the ocean’s well being and also for more information on how to create awareness for the cause, visit http://www.theoceanproject.org/wod/about.php. SRM consultants recently attended the National Marine and Coastal Biodiversity Conference 2007 by the Maritime Institute of Malaysia (MIMA). 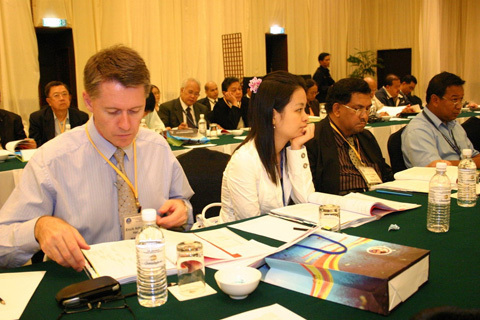 This conference was held from 17-18 April 2007 at the MIMA Conference Room. The conference involved paper presentations on various aspects of coastal and marine biodiversity. Speakers from Universities, Government, and Non-Governmental Organisations presented findings of their research over the years in Malaysia.